Welcome to the cleanest and friendliest gym in Carson City! We realize that the toughest step is often taking that first step into a gym. Here, you can be yourself, go at your own pace, get the support and inspiration you need to achieve your best every day. Eagle Fitness is 10,000 square feet of FITNESS FUN! We have over 100 pieces of state of the art machines from Hammer Strength, Life Fitness, Freemotion, Precor and Lemond. You’ll never have a problem finding a clean, well maintained piece of equipment to workout on. PLUS, there is no need to be intimidated. Just ask one of our knowledgeable personal trainers for proper machine usage and technique and they would be happy to help! Our staff is here to serve and brighten your day, but it’s our incredible members that make Eagle Fitness the best gym in town. 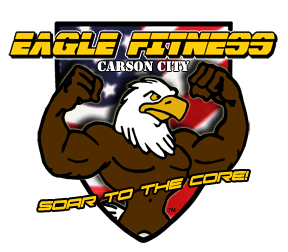 Come see why we have been around for over 15 years and become part of our Eagle Fitness family! Try it before you buy it! Visit our front desk to receive a FREE 3 Day VIP Pass, including classes and Kids Club to see if Eagle Fitness and you are the perfect fit! Don't worry, you will be.